Keeshonds have unique 'spectacle-like' markings around their eyes giving them an intelligent look. Their thick fur is puffy and fluffy giving them a bigger appearance. In reality the Keeshond is a compact dog. Lively, warm, and great with kids. Keeshonds are of Arctic Origin. Keeshonds are 15 to 19 inches (40 to 48cm) high. Keeshonds weigh either 55 to 66 pounds (25 to 30kg) or 35 to 45 pounds (15 to 20kg). 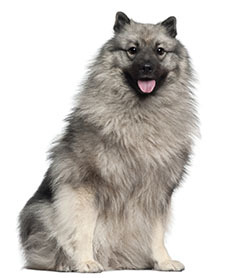 The body of a Keeshond's coat is gray with black tips while its legs and feet are cream-colored. Keeshonds shed during the spring and the fall. Their coats must be brushed daily, with and against the grain to ensure it is free of tangles and bits of debris. The friendly Keeshond loves nothing more than being a part of the family. A swimmer, companion and watchdog, Keeshonds are lively and warm and love bouncing around with children. Genetically Keeshonds are prone to epilepsy, they are also prone to skin problems heart disease and may become overweight easily if overfed. Keeshonds can be expected to live about 12 to 15 years. Keeshonds cannot stand the heat well and prefer cooler environments. This breed requires a medium sized yard and daily exercise. The beautiful silver and black Keeshond (pronounced kayz-hawnd) is one of the few dog breeds to have originated in the Netherlands. The dog is relatively rare in the United States, but is gaining in popularity, having jumped from number 103 to the number 86 spot on the AKC’s most registered dogs list in 2013. 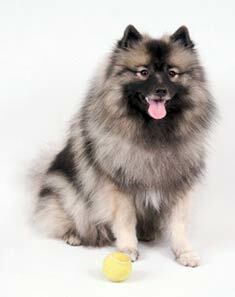 The Keeshond is of medium size, about 17- 18 inches tall and weighing usually 30 – 40 pounds when full grown. The richly plumed tail curls up over the back, and there is a prominent ruff of fur around the collar area. The ruff is generally more pronounced in males than in females. The ears are small, triangular and erect. These dogs have a double-layer coat that is silver and black and simply stunning. The soft undercoat is pale grey and downy, while the top coat is grey with black tips and somewhat harsh. The marking on the coat is what makes this dog so distinct and beautiful. The plume of the tail is grey, but the tip is black. The legs and feet are a light grey – almost to the point of being cream colored, creating the effect of trousers. The shoulder lines are marked with grey. The ears are always dark. There should not be any white on the dog at all. The top portion of the face is grey, with small black lines forming granny glasses markings around the eyes. This type of marking is known as spectacles. This type of marking around the eyes is known as spectacles. Like most double-coated dogs, the Keeshond blows his undercoat seasonally. For males, this typically occurs once per year, while females go through the process twice. The entire undercoat is shed over about two weeks so a new one can grow in. You might be tempted to shave your Keeshond to avoid the mess of the late pre-summer molt, but resist! The double coat provides insulation from the hot weather, allowing your dog to keep his cool through the summer. Clipping also results in the loss of the black tips on the fur, removing much of the distinctive beauty of the dog. Frequent bathing will do nothing but dry out your dog’s skin. 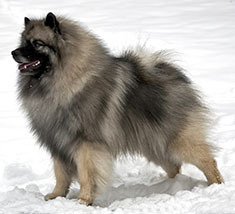 Brushing is the preferred method of removing dirt from a Keeshond’s coat. The coat should be brushed twice weekly, not only to remove dirt, but also to keep skin oils distributed through the coat and to remove any dead fur. Where did the Keeshond come from? The original function of Keeshonden was to guard barges. In the 18th century, the Netherlands experienced a rebellion against the ruling House of Orange. One of the rebel patriots, Cornelius de Gyselaer, gave his nickname (Kees) to the breed, and the dog became a symbol of the rebellion. When the House of Orange returned to power, the breed nearly became extinct and was not bred popularly until the mid 1920’s. The comeback appears to have occurred simultaneously in both England (where the dog was known as the Dutch Barge Dog) and in the US. The importation of this breed into the United States is credited to German Carl Hinderer, who brought his Schloss Adelsburg Kennel from Germany to America in 1923. At that time, the dog was known in the US as the Wolfspitz due to its similarities to the other dogs of Spitz ancestry, such as the Chow Chow, the Pomeranian, and the American Eskimo dog. Like most double-coated dogs, the Keeshond blows his undercoat seasonally. Because feelings of ill will toward Germany followed the First World War, the AKC was reluctant to register the Wolfspitz. 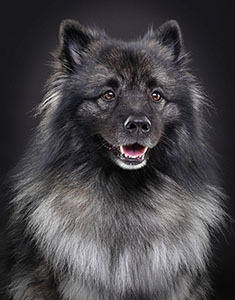 However, when Herr Hinderer brought one of his dogs with him to AKC headquarters in New York City, the Club’s president, Dr. DeMond, was so taken with the dog, he agreed to begin registrations in 1930, but only if the name was changed to Keeshond. Hinderer also translated the breed standard from German into English. What is the temperament of a Keeshond? These smart, playful dogs are known for their ability to quickly learn new tricks. The problem is that they will learn tricks you really wish they didn’t know, so you must be careful which behaviors you reward and which ones you ignore. If they were larger in size, Keeshonden would make excellent guide dogs for the blind because they are so smart and eager to please. Given their smaller size, they are often used as therapy dogs, helping children and others feel more at ease during personal crises. At least one Keeshond was at Ground Zero in New York following the 9/11 blast, where she comforted rescue workers overcome by the carnage. Keeshonden love their people and do not do well if kept isolated in a kennel or back yard. In fact, they often become so clingy, they are referred to as a Velcro dog. They will sit by a closed door for hours, just waiting for their favorite person to return. They need to be kept mentally stimulated to avoid the destructive chewing and digging associated with boredom. If kept alone for long periods, Keeshonden have a tendency to become problem barkers. You may hear Keeshonden referred to as the “smiling Dutchman” due to their heritage and friendly disposition. In keeping with their barge-guarding heritage Keeshonden are great watch dogs and will bark loudly at strangers. However, they will follow their family’s lead, accepting the stranger as a friend if the family does so. They are not known for aggression. This breed is good with children and other dogs, and responds well to positive training methods. Slightly timid, the dog will react stubbornly if harsh training methods are used. Are there any health concerns with Keeshonden? 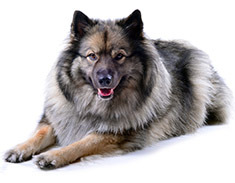 The Keeshond is a generally healthy breed, with most of them living well past the age of 10. Average age at death is 12 years old, and one in four dogs will remain in good health until they die of simple old age after about 14 - 15 years. There are a few diseases which can (rarely) be passed genetically in Keeshonden. Hip dyslplasia, luxating patellas, epilepsy, Cushing’s disease, diabetes and primary hyperparathyroidism are among the most common. Prospective puppy buyers can improve their chances of getting a healthy dog by asking the breeder for documentation regarding the health of both parents from the Orthopedic Foundation of America (OFA) and from the Veterinary Diagnostic Laboratory at Cornell University, which recently isolated the gene responsible for primary hyperparathyroidism. Is the Keeshond the right dog for me? If you are looking for a wonderful family companion who wants nothing more than to be with you, the Keeshond may be just the right dog for you. However, if you have an aversion to dealing with abundant shedding once or twice a year, or if you don’t have the spare time to play with your dog, you should consider a breed that doesn’t blow its coat and doesn’t mind spending time alone. Find Keeshond Puppies with our Free Breeder search!